Camp Wawona News: Generators Go Down in Heaviest Snowstorm of the Season. Generators Go Down in Heaviest Snowstorm of the Season. When it rains it pours…or in this case dumps. For five straight days Camp Wawona has experienced heavy amounts of snow with occasional breaks for rain. Power went out early in the week so camp staff turned to the two large generators in lower camp to fill the need. 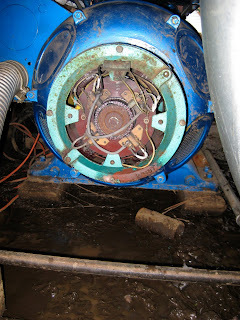 After 15 hours of continuous use, Generator 2, which powers the office, cafeteria, and upper camp, failed to generate power even though the motor was running fine. With the fridge warming up and the phone lines down, God answered camp staffs prayer for help in the form of a generator repairperson who happened to be in the area. With some rewiring and calculated breaker switch-flipping, the camp was able to limp along on one Generator 1. However, less than 24 hours later, Generator 1 experienced an excessive power load and had to be shut down to preserve its structural integrity. After the load was adjusted via the breaker panel, CW staff attempted to restart Generator 1 without success. With the failure of both generators camp is currently without power meaning a total loss of communications and a food supply in danger of spoiling as it warms. Neighbors of Camp Wawona have been lending a helpful hand in trying to diagnose the generator issues but with no luck. Park officials estimate power will not be fully restored until Friday, January 29. Still unsure of what is causing the generators to fail, camp staff face a repair bill ranging from $4,000 at best for new parts to $50,000 at worst for two new generators. The Generator House located in Lower Camp. Ryan Kloosterhuis measures power coming from Generator 1. 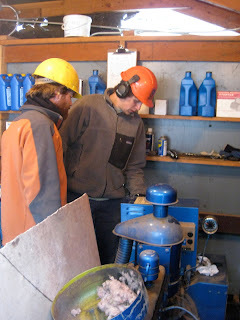 Anthony Handal and Ryan Kloosterhuis work on Generator 2. The back of Generator 2.
who needs to go to Africa to live life with a generator? way to be out there on the front lines of pioneer living.